This pdf from Raging Swan Pressis 24 pages long, 1 page front cover, 1 page blank inside front cover, 2 pages editorial, 1 page ToC, 1 page SRD, 1 page advertisement and 1 page back cover, leaving 16 pages of content. There is scarcely a situation as annoying as the PCs unexpectedly retracking to a town to purchase supplies and spending loot. 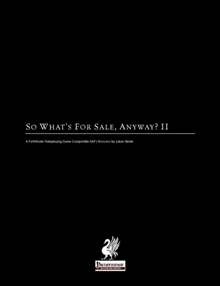 Raging Swan’s first “So what’s for sale, anyway” remedied that by providing a plethora of lists sorted by settlement-size. This sequel to said pdf provides more of these item-lists, which essentially means that as a reviewer you have to look up the items and make sure they’re appropriate for the settlement-size. There are some changes, though, which are readily apparent when checking out the 21 thorp-lists – namely 4 curses for minor items as well as a list of 10 sample sellers with short fluff-write-ups (but, of course, sans statblocks). These sample sellers are an AWESOME idea, helping with a simulationalist’s approach to a campaign world or simply offering names and personal quirks for merchant xyz. Even better, the merchants may provide minor and major hooks and can easily be expanded upon. Neat! Hamlets also get 21 lists and 10 sellers, but no curses. Villages get 11 lists, 10 sellers and 6 curses, small towns get 8 lists, 10 sellers and 6 curses, large towns get 8 lists, 10 sellers and 5 curses, small cities get 6 lists, 10 sellers, 8 curses, large cities get 6 lists, 3 curses and 10 sellers and finally, there are 6 lists for Metropolis-class settlements, 10 sellers and 6 curses. It’s also rather interesting to see that the sellers of larger settlements tend to be more powerful, corresponding to the items they own, sell, etc., keeping the in-game logic intact. Editing and formatting are top-notch, as I’ve come to expect from Raging Swan Press. Layout adheres to the clear and printer-friendly two-column standard and comes with extensive bookmarks. The pdf also comes with a special version optimized for use with e-readers. Content-wise, there is nothing to complain about, the inclusion of sample sellers and curses help to further customize the individual shopping experiences. That being said, we do get a lot of lists that really help customize individual shopping experiences and the pdf goes above and beyond its predecessor by providing more than necessary. Were I to voice any kind of criticism, then that I would have loved to see more complex curses or one or two specific, unique items. Seeing that this is not enough to rate this pdf down, I’ll settle for a final verdict of 5 stars – a very useful, nice little pdf.